These electromagnetic fields—the result of global lightning activity known as Schumann Resonances—are weak and difficult to detect. Scientists never suspected that they had any tangible impact on life on Earth. But a new Tel Aviv University study finds that these fields may have protective properties for organisms living under stress conditions. "We found that under controlled conditions, the Schumann Resonance fields certainly had an effect on living tissues," Prof. Price says. "The most important effect was that the atmospheric ELF fields actually protected cells under stress conditions. 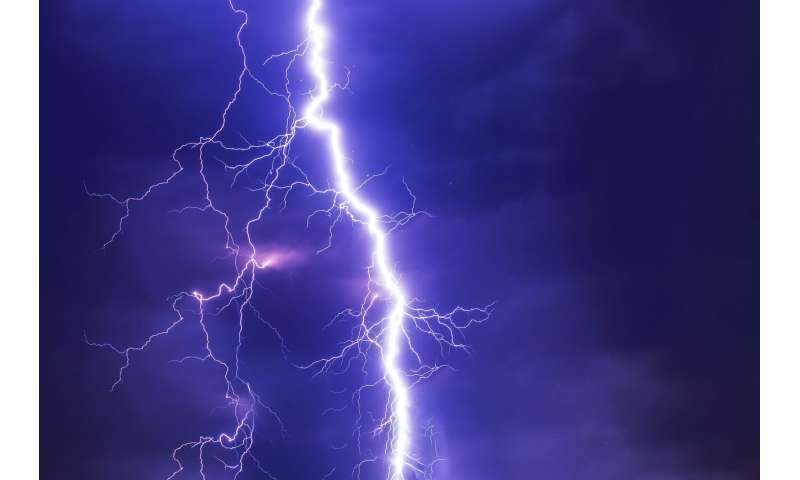 In other words, when biological cells are under stress—due to lack of oxygen, for example—the atmospheric fields from lightning appear to protect them from damage. This may be related to the evolutionary role these fields have played on living organisms." Seeing how much they lie I have to cite the parable of the boy who cried wolf. Maybe they should all vote for something other than lying. So where are you from, Sergei? St. Petersburg? Moscow? Go eat some black bread and drink some wodka. So, is this THE Dirk Bruere? OR just an admirer? Under the correct conditions, pulsed magnetic and/or electric stimulation *may* aid healing by kick-starting reluctant osteocytes etc. UK's NICE regulators recently agreed use of some such equipment. Snag is, there's so much 'woo' swirling around 'Schumann Resonance' and associated phenomena that trying to find real science is very, very hard. Here's an interesting question: might some sort of magnetic therapy help with bone calcium loss in astronauts? It's not like we don't have a space station to test it. I'm having a hard time getting around how electricity was invented. Which would explain why the rest of this looks manufactured. Since there's lightning it's obvious electricity wasn't invented. It was discovered. Maybe you've heard of Franklin's kite experiments. As ever, YMMV, and Due Care, Please. Considering TENS I'm surprised anyone would laugh. Did they ask the astronauts? Im assuming from the slant of the "wit" in your answer that the "they" you refer are Soviet scientists or reporters of their discoveries (propagandists might the right term). But my thinking-challenged friend, most of the information or reports from the Soviet Union to the great Western capitalist empires came through theGovt.Services of those western nations. So by default those "they" are actually yours and all that lying was from your govt. for your dimly-lit benefit. So you must be the starshina. Many Russian scientists have discovered many interesting pieces of science, But when you start bragging about it, especially after plotting to overthrow the government of the US you'll find that a lot of us get pretty suspicious. Especially when this is your first post here. Ordinary person posting here. Being retired on SS, I have come to the conclusion years ago that science is not shared, significant discoveries seem to have been sidelined only to be 'rediscovered' later when it is convenient for the powers-that-be. Oh, and you don't have to dis me as a troll, my home town already took maximum punishment for being a know-it-all. @katesisco Yeah, that's why there's videos of cars running on nothing but water from the 80s, patents in the 90s, and then they vanish off the planet like smoke in a windstorm. "National Socialist black metal (also known as NSBM, Aryan black metal or Neo-Nazi black metal), is a political philosophy within black metal music that promotes Nazism or similar ideologies. NSBM artists typically combine neo-Nazi ideology with ethnic European paganism and opposition to "foreign" religions such as Christianity, Islam and Judaism. However, some artists are Satanists or occultists, rather than pagans. NSBM is not seen as a distinct genre, but as a neo-völkisch movement within black metal. According to Mattias Gardell, NSBM musicians see this ideology as "a logical extension of the political and spiritual dissidence inherent in black metal"." Da Schniebo will, of course, deny it. Look for his references to the mysterious "jebus", which seems to be a cultish personage in whose existence Da Schneibo strongly believes. You mentioned "great Capitalist western empires". I find that quite interesting. Other than poverty-stricken western countries such as Cuba and Venezuela whose common people are currently enjoying starvation, poor economy, lack of the basic essentials, high unemployment or no employment, and low medical resources under the Maduro and Castro dictatorships which prohibit Capitalism - the USA, Canada and others in the western hemisphere have wonderful economies and high good-paying employment. However, the anti-Capitalist Socialists who have recently been elected to serve in the US Congress are trying to convince their voters that Capitalism is evil and Socialism/Communism is good. Somehow, the clueless millennials have bought into such pigswill by the once great Democrat Party of the US - and will most likely vote for more Socialist/Communists in 2020 - which will make their attempt to transition the USA into something that resembles the USSR under Stalin. "These electromagnetic fields—the result of global lightning activity known as Schumann Resonances—are weak and difficult to detect. Scientists never suspected that they had any tangible impact on life on Earth. But a new Tel Aviv University study finds that these fields may have protective properties for organisms living under stress conditions." Ahaa - so Science is finally finding out that life forms of Earth are protected, as it had been for the past billion or so years since the creation of the first cells in the waters of Earth. Life forms of Earth hold a very UNIQUE place in this corner of the Universe - which scientists will gradually be finding out - slowly but surely. The Dinosaurs were wiped out for a good reason - death by asteroid - to make way for future sentient life forms that could not compete otherwise. It is the Grand Design - for which all humans should be thankful. Quite correct, but I'd add in addition to "when it is convenient", I'd say "when its unavoidable". As technology advances it becomes more difficult to hide things, or it becomes easier for anyone to notice what has been ignored. These benefits to cells by EM fields has been known for a long time. The Flexner report may have done some things to standardize medicine, but it also did a lot to remove, or hide useful benefits. It sounds almost like a genre fantasy novel, neurons clocked by a global heartbeat. No, the movement of charge is responsible. The chemicals are the medium which provides the charges. Anyway, biology evolved as an adaptive response to such global phenomena. So, any "protective" attributes are merely an example of adaptation. Just as EM fields can be protective, they can also be destructive. Life has adapted to some natural sources of EM fields and can thrive in them but has been shown to suffer ill-effects from high energy space storms caused by the Sun. Time will tell what implications of exposure to the various anthropogenic EM fields will be. Actually, direct electrical transmission happens only at synapses, and only some of those; some synapses are chemical. The signal down an axon from a neuron is electrochemical, which is why nerve impulses move only a few tens of feet per second at most instead of at the speed of light. It's also noteworthy that the electrical transmission across a synapse is not electrons; it is ions. So the point is debatable, particularly since axons make up most of the body of a nerve. No, not joking. The article says "all living organisms have electrical activity in the same ELF spectral range." There *are* synchronized waves of activity in the brain &c.
@O, they all operate on their own synchronization, not from some outside force. You know this how? Remember, the article did say there was "an effect on living tissues" albeit "under controlled conditions." And that this supposed self-synchronization just happens to be at about the same rate as the lighting-induced background. Remember, too, that I'm not saying This Proves A Hard Gaian Hypothesis or anything! I'm more saying how twee it would be if it does turn out that there is this sort of global neural clock because, say, some of the ions are somehow 'surfing' the ELF in some way. @O, IMHO, you know NOT of what you speak. Begone. It is sad to hear of your close relative's epileptic seizures. Perhaps science will come up with a cure for his or her condition soon. But Onathan did not say anything specific to your relative's health problems - only referring to what is in the article. Many humans suffer from all forms of epilepsy, as well as many other diseases. So this article that describes a new-found anomaly that is a part of the Earth's Natural Order may one day eliminate, or at least help science to understand better how to cure common diseases. After having read the "Summary and Conclusions" in the DOI report of this article, I am more convinced than ever that the human and animal physical body is a programmed Machine that responds to outside forces/stimuli, and may actually depend on such outside stimuli to retain the Life Force itself. This is amazing in that the physical responses of heart cells to the Electromagnetic Field (EMF) - even after the removal of those cells (having been excised from the physical body) - then washed, cleaned of remaining blood and placed in solutions - then zapped with low power EMF - causes such cells to beat as though still alive. Can this method bring back the dead, under certain conditions? Would they want to come back? Can this method bring back the dead, under certain conditions? oh, well then! f*ck the science, eggy is convinced! You add purpose to these lonely souls Lifetime! We are part of nature, whether science is able to document it or not. It would be nice if scientists would not limit us to just what science knows. Like the assertion that vaccines are science. Well maybe many of the illnesses we get also have protective affects that science can't document. Syncopation only works on the individual organism level. so, what does the science say about the efficacy and safety of vaccines? "Can this method bring back the dead, under certain conditions? Would they want to come back?" And a default of 'YES' unless 'DNR' posted ?? That is correct. The human and animal bodies are programmed by the Natural Order to help eliminate disease-causing organisms through the immune system that fights off infections under most conditions. This protection has been with humans and animals long before there were any scientists/researchers to find these things out. Many childhood diseases provide immunity for life, once contracted - such as German measles and mumps. Humans had been programmed for such immunity. If it didn't kill you when you had it - you will never get it again. @SEU: Vaccination gives you the benefits of such prior exposure WITHOUT the mortal risk of the illness and complications, scarring etc. Remember Smallpox ? Polio ?? on that last link, check out the treatments under "Drugs Used for Asystole Resuscitation"
@Captain, IIRC, defib-related stuff is used to stop and re-start the heart for 'open access' surgery. Yes. I do remember them well. Also cholera, whooping cough, leprosy and others whose names I no longer recall. In those days there were no such things as injectable medications nor was there anesthesia. Humans suffered and died. You are fortunate to be living in these times.